Coastal Erosion Advisory Services | Need help analyzing what to do about coastal erosion on your shorefront property? Need help analyzing what to do about coastal erosion on your shorefront property? Jim’s work is all about living in the Coastal Zone, working with the dynamic forces of waves, currents, winds, and sea level rise. These forces transport silt, sand, and cobble and constantly shape and re-shape coastal landforms, such as beaches, dunes, barrier beaches and coastal banks. This is a dynamic environment that requires an understanding of the processes that drive coastal landform changes if we are to live in harmony with the coast. 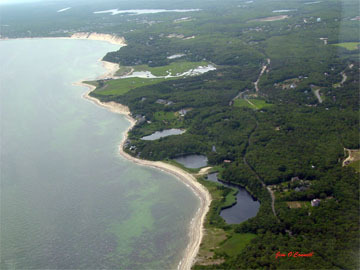 Jim O’Connell been working professionally as a coastal geologist & coastal land-use specialist for close to 30 years. jimoconnell28@gmail.com or 781-588-0502. Presently he is a Coastal Geologist/Coastal Land-use Specialist and principal with Coastal Advisory Services, a small consulting firm on the south shore of Massachusetts offering specialist services on coastal erosion control alternatives; coastal landform delineations; and expert testimony on a variety of coastal-related issues. Jim has worked as a coastal geologist and coastal processes specialist for the Federal Emergency Management Agency; University of Hawaii Sea Grant Program on the Island of Kauai; Woods Hole Oceanographic Institution’s Sea Grant Program; Cape Cod Cooperative Extension; Cape Cod Commission; Massachusetts Coastal Zone Management; and, the Town of Scituate as their Conservation Agent. For the past 15 years Jim has been serving on the Board of Directors for the non-profit organization the Duxbury Beach Reservation, Inc., owners in-trust of a 4.5 mile long barrier beach. He was also recently appointed to the newly formed state Land Subject to Coastal Storm Flowage Task Force. Jim was also a member of the Marshfield Conservation Commission, and member of the Board of Directors of the North & South Rivers Watershed Association, National Coastal Society, and the N.E. Floodplain and Stormwater Managers Association. If you are looking for help with your beach front property challenges, you have come to the right person. Contact Jim at jimoconnell28@gmail.com or 781-588-0502. A contribution in a scientific workshop to review the state of the science regarding the physical and biologicsl impacts of armoring on sheltered shorelines (such as those of Puget Sound).